"Sales of existing homes in Florida rose 27% in April, which means that sales activity has increased in the year-to-year comparison for 20 months, according to the latest housing data released by Florida Realtors. Another positive sign: Last month's statewide existing-home median price of $140,100 was 1 percent higher than the statewide median price in April 2009. Existing home sales rose 27% last month with a total of 16,781 homes sold statewide compared to 13,244 homes sold in April 2009 (see chart). Statewide existing home sales last month increased nearly 3 percent over statewide sales activity in March. Meanwhile, April's statewide existing-home median price was 2.3% higher than March's statewide existing-home median price of $137,000. It marks the second month in a row that the statewide existing-home median price has increased over the previous month's median." MP: Assuming the median home price in Florida is not too different from the mean home price, the total housing sales volume in the state increased from about $1.84 billion in April 2009 to about $2.35 billion in April 2010, for almost a 28% increase. If we measured housing market activity like we measured vehicle sales - in unit sales, without regard to price - we would conclude that the Florida housing market is booming, with 20 consecutive monthly increases compared to the same month in the previous year, and a whopping 27% increase from April of last year. 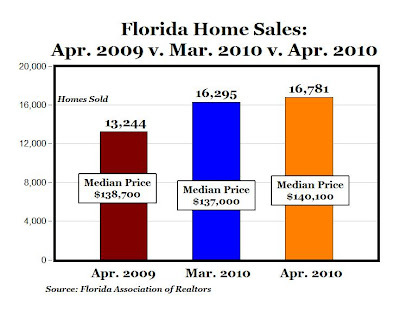 And if we measured housing activity like we measure retail sales (total sales volume), we would also conclude that the Florida housing market is doing quite well, with something like a 28% increase in sales volume (assuming the median home price is an accurate estimate of the mean home price) in April compared to last year. 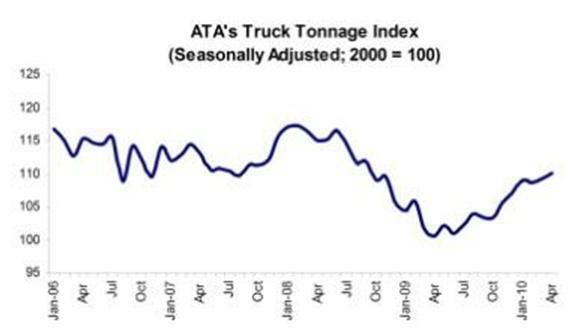 "The American Trucking Associations’ seasonally adjusted (SA) Truck Tonnage Index increased for the sixth time in the last seven months, gaining another 0.9% in April. This followed a 0.4% increase in March. The latest improvement put the SA index at 110.2, which is the highest level since September 2008 (see chart above). Compared with April 2009, SA tonnage surged 9.4 percent, which was the fifth consecutive year-over-year gain and the largest increase since January 2005. Year-to-date, tonnage is up 6% compared with the same period in 2009." "The outlook for the restaurant industry remained positive in April, as the National Restaurant Association's comprehensive index of restaurant activity was essentially unchanged from its March level. 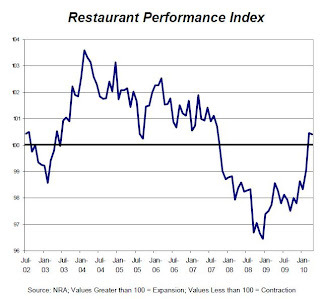 The Association's Restaurant Performance Index (RPI) a monthly composite index that tracks the health of and outlook for the U.S. restaurant industry stood at 100.4 in April, down slightly from its March level of 100.5. More importantly, the RPI stood above 100 for the second consecutive month, which signifies expansion in the index of key industry indicators." 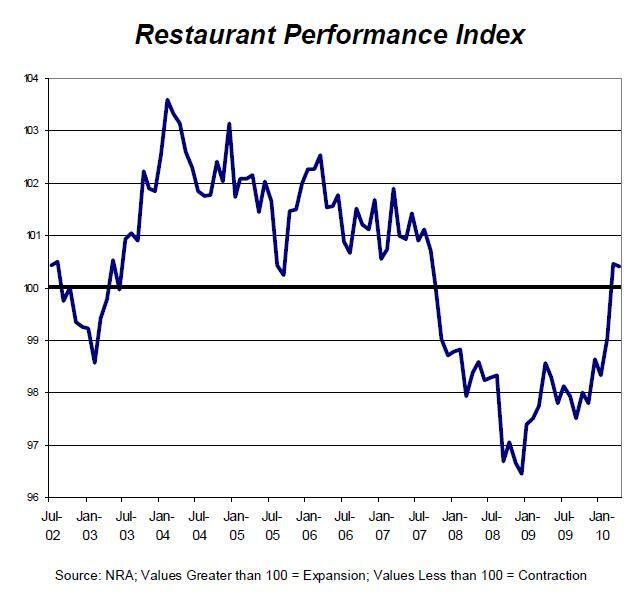 MP: The Restaurant Performance in April (100.4), like in March (100.5), reached the highest level since the fall of 2007, and stayed above 100 for two consecutive months for the first time since the recession started in December 2007. "Why is that when BP screws up we make sure they pay every dime in damages, but if a bank (MP: or automobile company like GM, or insurance company like AIG, or GSE like Fannie and Freddie) screws up, we bail them out with taxpayer money? "Gulf of Mexico (GOM) oil production began from shallow water fields (water depth of under 1,000 feet) but shallow water production began to fall in 1998. 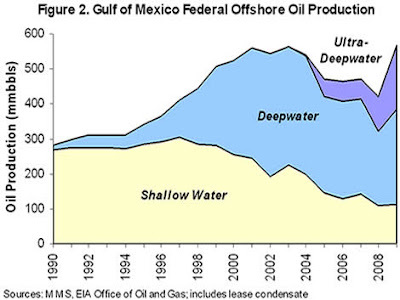 Steadily increasing volumes from deepwater fields (water depths between 1,000 and 4,999 feet) offset these declines until 2004, after which deepwater production also began to decline (see chart above). But, ultra-deepwater production (water depths more than 5,000 feet) has risen dramatically since 2004 (and more than tripled since 2005), stemming the overall decline in GOM production. A trio of high-profile ultra-deepwater discoveries - Atlantis, Thunder Horse, and Great White (part of the Perdido development) - has recently started producing. Several more are in various stages of development." HT: Paul Kedrosky, who argues that "part of what we're seeing here is the inevitable "normal accidents" from changing technology as we transition from one extraction depth regime to another." 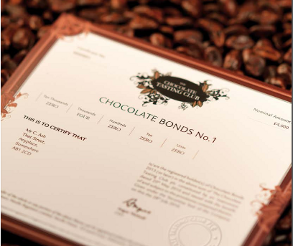 A U.K. chocolate company is offering high-interest bonds where coupon payments are paid in chocolate instead of cash. Should We End the 30-Year Fixed-Rate Mortgage? The United States is one of the only countries in the world with 30-year fixed rates for mortgages, and Arnold Kling suggests that this is "an artifact of government intervention, and that without it we would have a simpler, safer mortgage finance system." For example, Canadian mortgages carry a fixed interest rate for a maximum of five years, and rates are then re-negotiated for the next five years, similar to a five-year adjustable rate. That type of five-year mortgage is much more typical around the world than the U.S. system of fixed-rates for 30 years. The reason the 30-year fixed-rate mortgage has to be a creation of government intervention, and not the market, is that it is a one-sided loan arrangement that bestows huge benefits on the borrower, but with almost no compensating benefits for the lender/bank/thrift, i.e. it's "pro-borrower and anti-lender." As Arnold points out, there is an extremely valuable pre-payment option on a 30-year fixed-rate mortgage that favors the borrower, who can re-finance the mortgage whenever it is to his/her advantage over the 30 years, i.e. when rates fall enough to justify the refinancing costs. Lenders have no such option to renegotiate the rate when it's to their advantage - when interest rates rise. Or to be more accurate, the pre-payment option favors the borrower when it is under-priced, which is the case in the U.S., likely as a result of government influence. Looking again to Canada, refinancing mortgages is allowed, but there are very stiff prepayment penalties equivalent to about three months of mortgage interest (about $1,500 for every $100,000 mortgage amount), which discourages the kind of refinancing that frequently takes place in the United States and contributed to our real estate bubble and financial crisis. In other words, the pre-payment option under the Canadian system is probably much closer to a market-driven price than in the U.S. 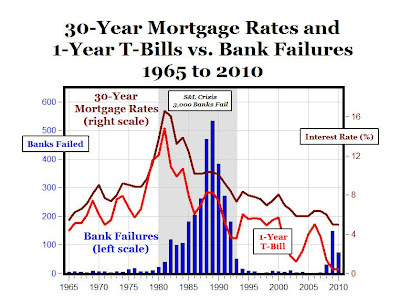 The chart above shows the potential danger to banks of 30-year fixed-rate mortgages, and illustrates how they contributed to the S&L crisis. Because S&'L's were "borrowing short and lending long," or financing 30-year fixed-rate mortgages with short-term deposits at interest rates approximated by the 1-year T-bill rate, S&Ls were "upside down" by the early 1980s. They were paying more on short-term deposits (e.g. 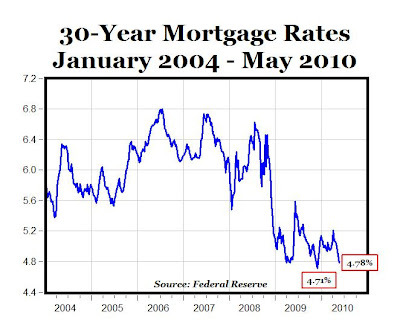 10-15%) than they were earning on their 30-year fixed-rate loans (e.g. 4-8%). 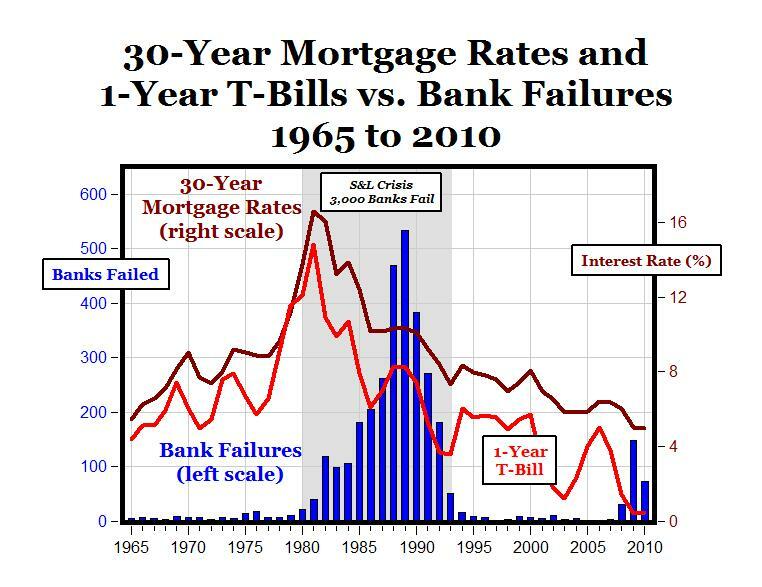 Simply put, 30-year fixed-rate mortgages were a major factor in 3,000 bank failures during the S&L crisis, and this helps support Arnold's position that they have to be an artifact of government intervention because banks wouldn't willingly expose themselves to such a huge level of interest rate risk with 30-year fixed-rate mortgages with under-priced pre-payment options. All it took was a period of rising interest rates in the 1970s and 1980s to force thousands of thrifts into insolvency, largely because their assets were so heavily concentrated in 30-year fixed-rate mortgages. 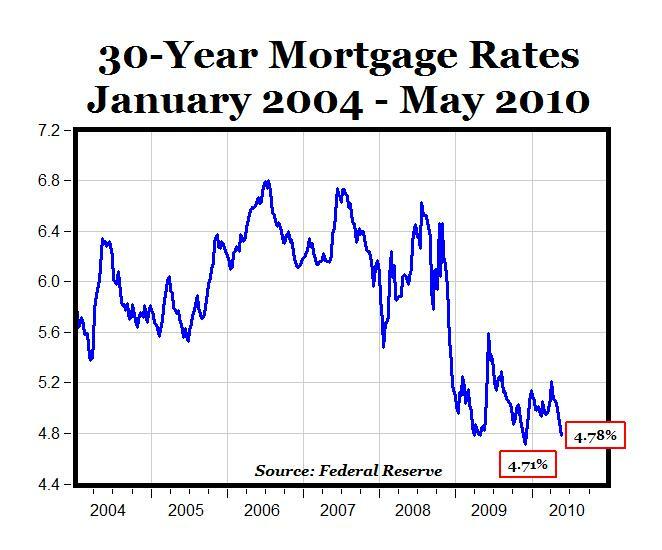 Q1: Now that 30-year mortgage rates are below 5% and close to historical low levels, are we in danger of setting up another S&L-type crisis sometime over the next several decades? It wouldn't take much of an increase in inflation and short-term interest rates before many banks/thrifts could see their interest margins squeezed, and short-term rates could conceivably even rise above 5% sometime in the next 30 years, which could put the banks "upside down" again and lead to failures. Q2: Shouldn't financial reform include putting an end to the pro-borrower, anti-lender 30-year fixed-rates mortgages in the U.S.? 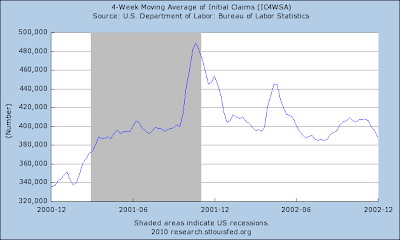 From the Association of American Railroads, for the week ended May 22 from the comparable week in 2009. 1. U.S. railroads originated 288,114 carloads during the week ended May 22, an increase of 10.6% from the comparable week in 2009 (down 12.4% from 2008). 2. Intermodal traffic was up 12.7 % from last year (down 7.9% from 2008). 3. Container volume increased 14.4 % (down 0.7% from 2008) and trailer volume rose 3.9% (down 34.4% from 2008). 4. Carload volume on Eastern railroads was up 13.6% from last year (down 17.9% from 2008). 5. In the West, carload volume was up 8.6% from last year (down 8.1% from 2008). 6. Fifteen of 19 carload commodity groups were up from last year, led by a 100% jump in metallic ores, a 79.7% gain in metals, 59.7% increase in coke, and then motor vehicles and equipment (46.8%), waste and scrap materials (32.4%), grain (22.8%), crushed stone, sand and gravel (22%), lumber and wood products (16.7%), nonmetallic minerals (15%), stone, clay and glass products (11.2%), and primary forest products, 10.3 percent. 1. A total of 4,462 new and resale houses sold in the Las Vegas metro area last month, down 8.5% from March but up 0.2% from a year earlier. A decline in sales between March and April is not unusual, with the decrease averaging 4.3%. 2. April’s home sales were the highest for that month since April 2006, when 6,663 homes sold, but it was 4.2% below the average April sales tally back to 1994. 3. April marked the 20th in a row in which sales have risen on a year-over-year basis, although last month’s increase was the smallest yet. 4. Foreclosure resales fell to 51.9% of resales in April, down from 53.5% in March and down from a record-high 73.7% in April 2009. Foreclosure resales have declined each month since the year-ago peak. 5. April's foreclosures of 51.9% were the lowest in more than two years, going back to March 2008. Consumer confidence increased in May to 73.6, according to the University of Michigan's report today. That was 1.4 points above April's reading of 72.2, and except for January's index level of 74.4, the highest confidence level since January 2008. 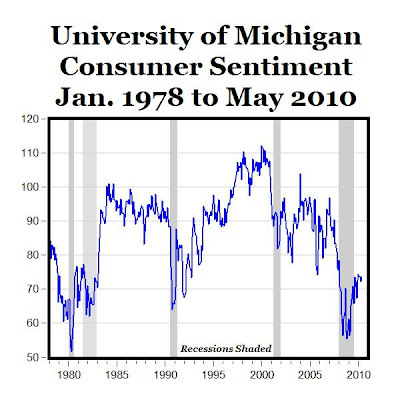 Reviewing the history of the Michigan Index back to 1978 in the graph above, consumer confidence was actually lower during the 1980 recession than in the most recent 2008-2009 recession. 1. A total of 9,972 new and resale houses and condos sold in the Phoenix metropolitan area in April, up 3.6% from March before and up 10.7% from a year earlier. April’s total sales were the highest for that month since April 2006, when 12,669 homes sold. 2. The region’s overall median sale price rose above the year-ago level for the second consecutive month, reflecting widening price stability and fewer foreclosures and other properties selling below $100,000. Buyers paid a median $135,889 last month for all new and resale houses and condos in the Phoenix metro area, up 0.7% from March and up 8.7% from $125,000 a year ago. 3. One of the most noticeable changes in the mix of sales this year versus last year is the decline in foreclosure resales: Last month they represented 50.5% of the resale market, compared with 64.9% a year earlier. The peak for foreclosure resales was 66.2% in March 2009. MP: Phoenix home sales for April are at a four-year high, median home prices are 8.7% above a year ago, and foreclosure sales are declining, all signs of a healing and recovering real estate market. Why Are We Drilling @ 5,000 Ft. in the First Place? "Why are we drilling in 5,000 feet of water in the first place? Many reasons, but this one goes unmentioned: Environmental chic has driven us out there. 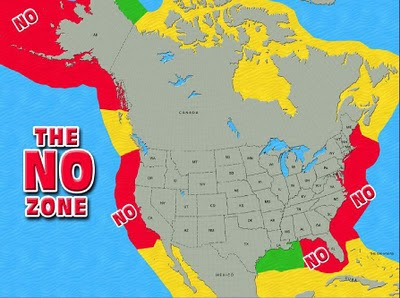 As production from the shallower Gulf of Mexico wells declines, we go deep (1,000 feet and more) and ultra deep (5,000 feet and more), in part because environmentalists have succeeded in rendering the Pacific and nearly all the Atlantic coast off-limits to oil production (see map above, source). And of course, in the safest of all places, on land, we've had a 30-year ban on drilling in the Arctic National Wildlife Refuge. So we go deep, ultradeep — to such a technological frontier that no precedent exists for the April 20 blowout in the Gulf of Mexico." According to data released yesterday by Freddie Mac, 30-year mortgage rates fell to 4.78% this week, which is close to an all-time historical low. 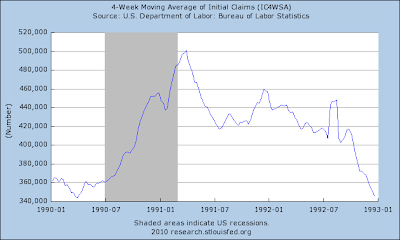 The 4.78% rate this week matches several previous weeks last April and December of 4.78%, and is just slightly above the all-time low of 4.71% in the first week of December 2009 (see chart above, data here). Gas prices (national average) have dropped over the last month, except for a small increase yesterday. Compared to $2.94 per gallon earlier in May, average gas prices at the pump have fallen about 17 cents to $2.77, which is about a 6% decrease (data here). 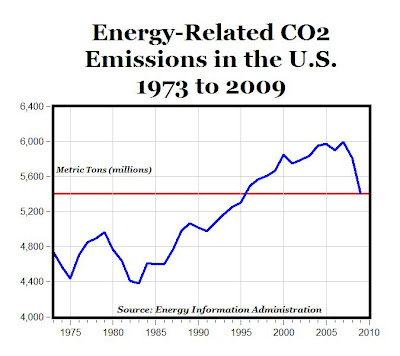 The Energy Information Administration (EIA) reported a few weeks ago that energy-related carbon dioxide (CO2) emissions in the United States fell in 2009 by the largest amount ever in a single year going back to 1973 when EIA records started (data here), both in absolute terms (a decline of 405 million metric tons) and in percentage terms (a seven percent decline). The seven percent decline last year along with a three percent drop in 2008, brought annual energy-related CO2 emissions in the U.S. down to the lowest level in any year since 1995 (see chart above). Amazingly, the U.S. generated fewer energy-related CO2 emissions in 2009 than in 1996, even though we produced almost 38 percent more output last year, our population has increased by almost 38 million, and our traffic volume was 22 percent higher last year than in 1996. The EIA estimates that only about one-third of the drop in CO2 emissions in 2009 was because of the economic slowdown and the reduction in real output, and the large majority of the decline resulted from the increasing energy efficiency of the economy and the ongoing reduction in the carbon intensity of our energy usage. Therefore, even without a recession in the first half of the year, there would have been almost a five percent reduction in CO2 emissions in 2009, which still would have been one of the largest annual declines on record. 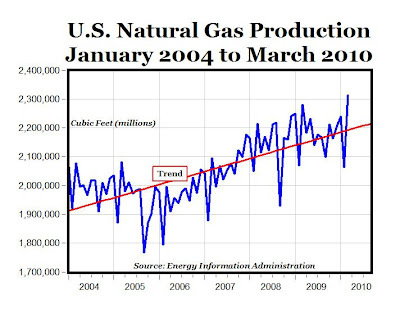 Our expanding output of domestic natural gas from shale rock, with its 45 percent lower carbon content than coal, has played a major role in reducing the carbon intensity of our overall energy supply, and helped bring down emissions last year to a 14-year low. Now that the U.S. has overtaken Russia as the world’s largest natural gas producer and our domestic production keeps setting new record highs, the significant improvements in carbon intensity and reduced emissions from using more natural gas should continue into the future. We’ve heard a lot of negative energy-related news lately including stories about the oil spill and environmental damage in the Gulf, and the coal mining deaths in April, but there has also been some extremely positive and environmentally-friendly data released recently by the EIA about U.S. energy usage and emissions. The positive energy statistics reported in May include new information showing that: a) the overall energy efficiency of the U.S. economy reached an all-time record high in 2009, b) there was less total energy consumed in the U.S. last year than in any year since 1996, and c) energy-related CO2 emissions fell by the largest amount last year in EIA history to the lowest level since 1995. Cross-posted at The Enterprise Blog. 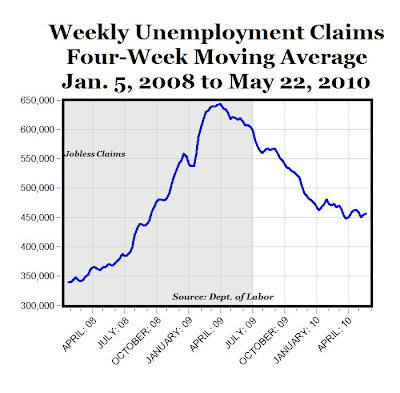 Weekly jobless claims were released today, showing a decrease of 14,000 from last week, while the four-week moving average moved up by 2,250 to 454,250 claims (see chart above). 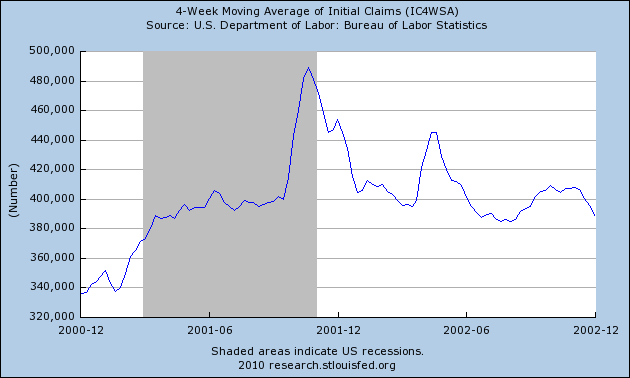 After a significant decline of almost 200,000 claims from about 650,000 in April 2009 to close to 450,000 weekly claims by early this year, the decline in weekly claims has slowed quite a bit in recent months, levelling out at about 450,000. 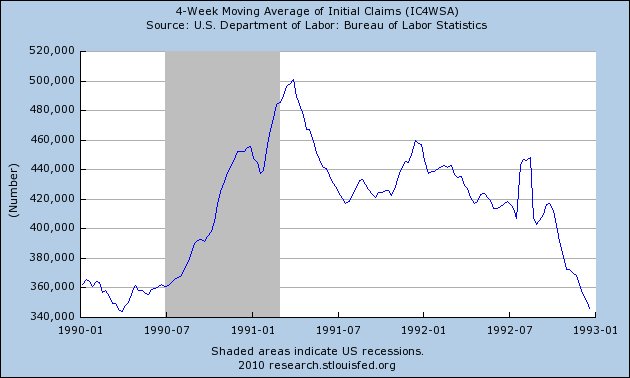 But that recent levelling and chopiness shouldn't create too much concern, since that pattern of jobless claims is to be expected in the first year or two following a recession. 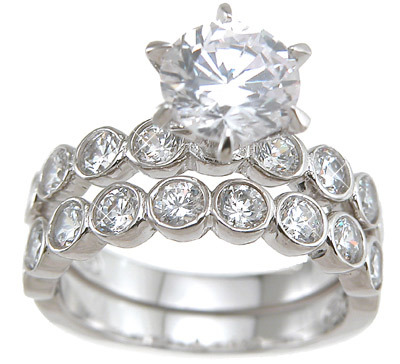 "Worldwide sales at Tiffany & Co. increased 22% in the first quarter ended April 30, 2010 due to growth in most regions and product categories. As a result of the strong, and higher-than-expected, sales growth and operating margin, net earnings more than doubled to $0.50 per diluted share." Sales in the Americas increased 22% to $315.3 million. Internet and catalog sales in the Americas rose 23%. In Asia-Pacific, sales increased 50% to $122.3 million. Sales in Europe rose 25% to $68.6 million. In Japan, sales declined 2% to $115.0 million. 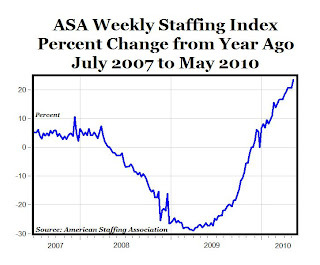 Worker Shortage in Washington with a Jobless Rate > 9%? Orchard Brings 1,000 Workers from Jamaica? A few weeks ago, I posted about how Michigan landscape companies can't find enough seasonal workers this year, even though Michigan has the highest jobless rate in the country at 14% in April. Here's a related story about a farm worker shortage in the state of Washington, even though the state unemployment rate has been above 9% for 12 straight months for the first time since 1984. "There was a moment when they first started calling this the "Great Recession," in 2008, that Steve Appel thought this might be the time. Americans might come back to working on the farm. "It's just common sense, with the depression and high unemployment and what not, that there ought to be local folks looking to come take some of these jobs," says Appel, 58, a wheat farmer in the Palouse in Eastern Washington. Nope. It hasn't happened. Farm jobs are going unfilled to such a degree that now a huge fruit orchard in Okanogan County, desperate for someone to pick cherries and apples this summer, has turned to flying in hundreds of workers from ... Jamaica. That's right. From a Caribbean island more than 3,000 miles away. In all, this one farm has applied to bring in more than a thousand temporary foreign workers." Update: Thanks to Ironman for this link, showing that Washington has the second most generous unemployment benefits in the country of $586 per week as of May 3 (behind Massachusetts, which pays $628 per week or more than $31,000 per year) or more than $28,000 per year working 0 hours per week. Farm workers would "only" make about $24,380 per year picking apples, so it wouldn't make sense to work, and that could explain the "worker shortage" and why the orchard needs to hire 1,000 workers from Jamaica. 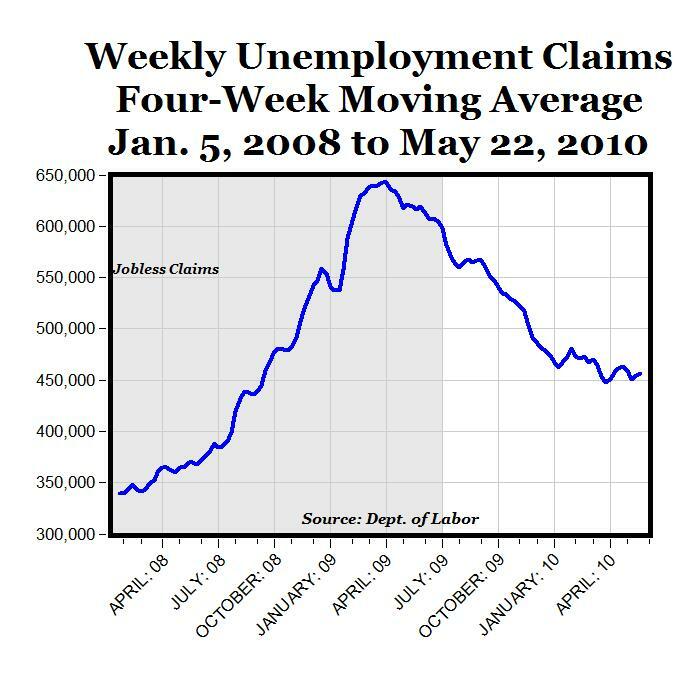 Question: How much lower than the current 9.9% would the jobless rate in the U.S. be today without the 99-weeks of unemployment benefits that can be as generous as $31,000 per year in some states? There is at least some evidence of "worker shortages" in Washington and Michigan, despite the "worst economic crisis since the Great Depression." "The Rasmussen Reports daily Presidential Tracking Poll for Wednesday (today) shows that 23% of the nation's voters Strongly Approve of the way that Barack Obama is performing his role as president. Forty-five percent (45%) Strongly Disapprove, giving Obama a Presidential Approval Index rating of -22. 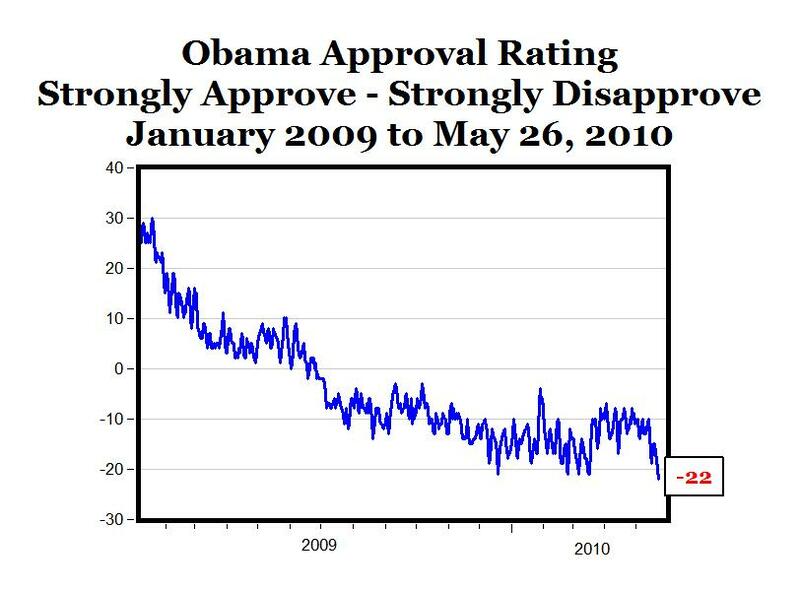 That’s the lowest Approval Index rating yet measured for this president (see trends)." "Children as young as seven are more likely to own a mobile phone than a book, figures show, fuelling fears over a decline in reading." New orders for durable manufactured goods in April reached the highest level ($193.9 billion) since September 2008 (see top chart above). The 12-month percentage increase in April of 19% followed double-digit increases in January (15%), February (14%) and March (17%), and was the highest yearly growth rate in almost ten years, since June 2000 (20%), see bottom chart. 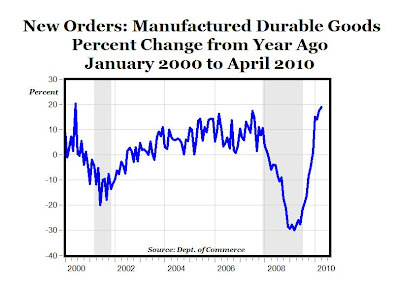 The five consecutive monthly increases starting in December marks the first time October 2007-February 2008 of five straight monthly positive increases in the annual growth rate of new orders for durable manufactured goods. 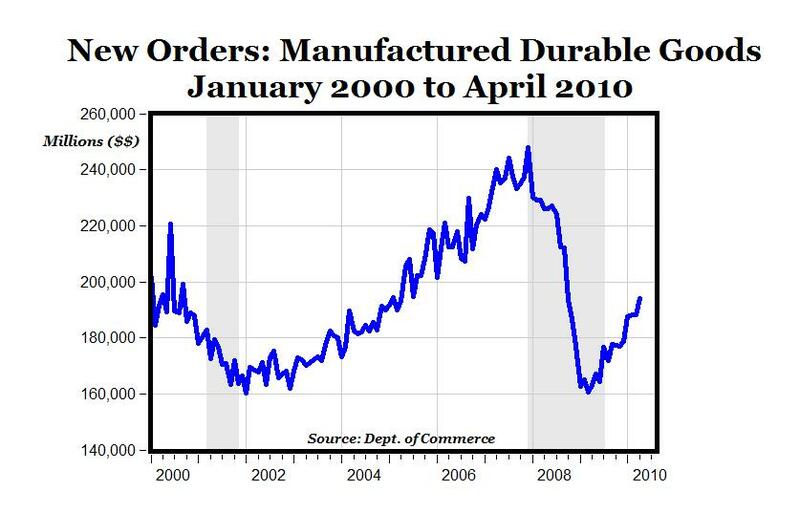 Add this to the growing list of V-shaped signs of an economic recovery gaining momentum, especially in the U.S. manufacturing sector, which added 44,000 new jobs in April - the largest single monthly gain in factory jobs since August 1998. "FedEx officials announced yesterday that the company would restore pilots to pre-recession workloads in July, a sign that business is looking up. The company also said it is bringing seven wide-body jets out of storage and plans to put them back in service before demand peaks this fall." 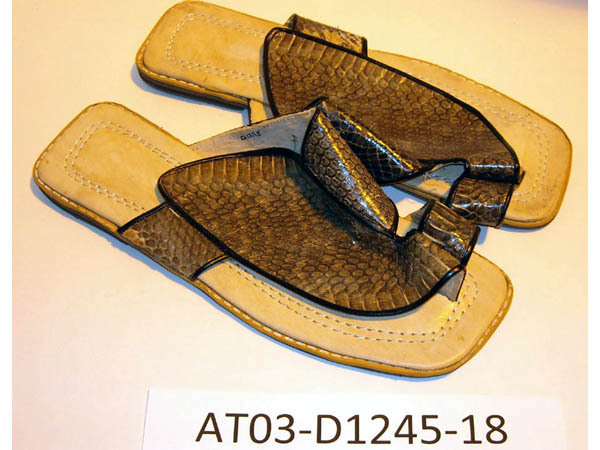 Pictured above is a pair of cobra sandals, available from the U.S. Fish and Wildlife Service's online auction of confiscated wildlife items that have been seized at U.S. ports for violating laws regulating international trade in wildlife. See related article in today's WSJ "Uncle Sam Wants You to Bid on This Fine Weasel Fur Coat" about the rolling online auction of 300,000 that started in February and will run through the summer. 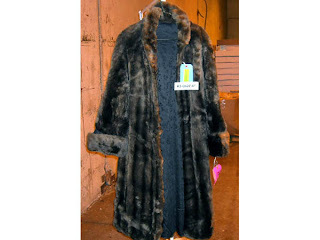 One item recently sold is the raccoon fur coat pictured below. Price? Only $220. April Real Estate Data for Michigan = Recovery? Bottom Line: With unit home sales in Michigan increasing this year for both: a) the month of April vs. last year, and b) YTD through April this year vs. last year, and with average home prices increasing by double-digits for: c) the month of April (14.87%), and d) YTD through April (12.16%), I think there's a case for a real estate recovery going on in Michigan this year. (CHICAGO) (WLS) -- "The price tag on a 16 gigabyte iPhone GS at Walmart stores will be $97 beginning this week. Apple's suggested price is $199. Walmart's deal requires a 2-year contract with AT&T. The reduced price comes less than two weeks before Apple is expected to unveil the next-generation model, which often leads to a dramatic drop in sales of older iPhones." According to the Case-Shiller Home Price Index data released today, Detroit-area home prices decreased by -4.62% from March 2009 to March 2010. "The S&P/Case-Shiller Home Price Indices are designed to be a reliable and consistent benchmark of housing prices in the United States. Their purpose is to measure the average change in home prices in a particular geographic market. 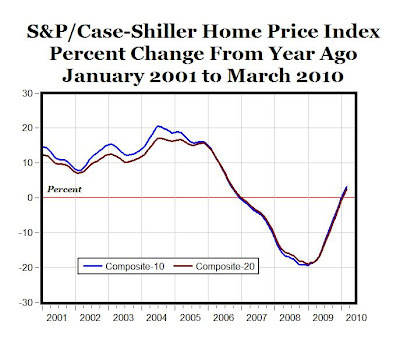 The monthly S&P/Case-Shiller Home Price Indices use the “repeat sales method” of index calculation – an approach that is widely recognized as the premier methodology for indexing housing prices – which uses data on properties that have sold at least twice, in order to capture the true appreciated value of each specific sales unit. To calculate the indices, data are collected on transactions of all residential properties during the months in question. The main variable used for index calculation is the price change between two arms-length sales of the same single-family home." In other words, it looks like the Case-Shiller index controls for quality of housing, and tries to compare the same exact house sold in two different periods. While that might be theoretically the premier methodology, it should also be recognized that there could be significant departures between prices from the Case-Shiller indices and average price data from housing sales. For example, all indications from the Michigan Association of Realtors are that home prices have increased in the Detroit area from a year ago, by double-digits in most cases for March, and year-to-date all areas except Livingston have experienced price increases, with double-digit increases for Detroit (+29.33%) and Oakland (+23.14%). Home prices have also increased statewide as well, both for March and for the first quarter (Jan-Mar). That's quite a different story than the -4.62% decrease in Detroit area home prices according to the Case-Shiller for March. 1. Two consecutive monthly increases in February home prices (0.71% for the seasonally-adjusted Composite-20 and 0.66% for the unadjusted index) and March (2.42% for the seasonally adjusted Composite-20 and 2.35% for the unadjusted index), following 37 consecutive monthly declines in the home price index. 2. The February and March increases were the first two back-to-back monthly gains in home prices since November and December 2006. 3. The March gain of 2.42% was the largest monthly increase in the Composite-20 index since October 2006. 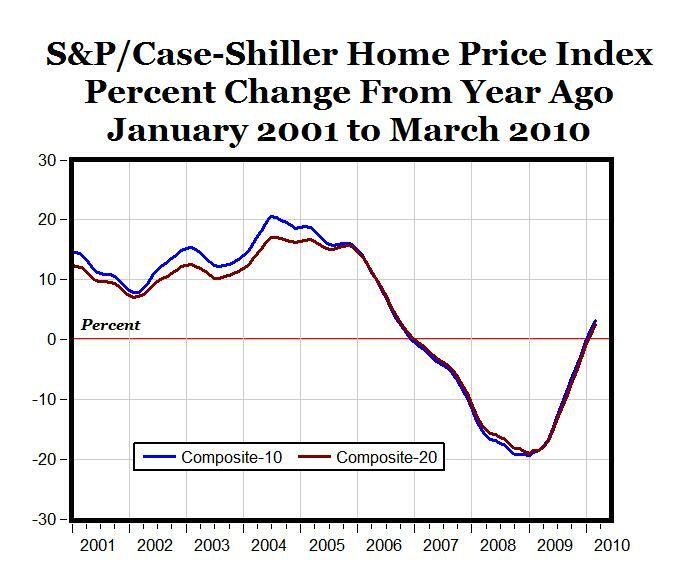 Note: The chart is based on the seasonally-adjusted Case-Shiller Home Price Indexes. The unadjusted indices produce almost identical results as those listed above. "Pennsylvania teachers are allowed up to 35 days a year off from actual teaching to instead work for their union, according to the contract negotiated between the local school district and the local teachers union. When a teacher take this time off, the school pays for a substitute in addition to paying the teacher’s normal salary, even while they are not in the classroom." In the union contract it states “A total of 35 teacher days upon request with advance notice will be granted for union business,” which Mr. Campbell says is separate from vacation days or other paid-time off. The contract was originally for 2005-2009 but was renewed through June 2010." Thanks to Charles D. Musick for providing the data, and thanks to Tableau software for creating the interactive chart above, showing government debt and deficits as a share of GDP, by party in power. Note that in the post-1950 period, deficits as a share of GDP are almost exactly regardless of which party was in control, or whether it was split. For a larger web version, go here. 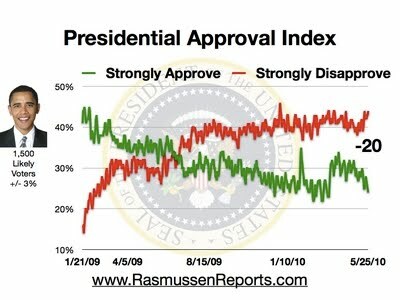 According to Rassmussen, 24% of the nation's voters strongly appprove of the way that Obama is performing his role as president and 44% strongly disapprove, resulting in a Presidential Approval Index rating of -20 (see chart above, see trends here). 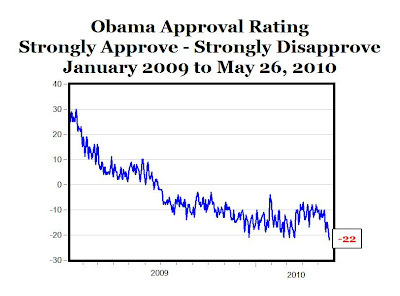 This is close to an all-time low for Obama - the only lower ratings were the readings of -21 on March 19 and 20. According to Intrade, there is a 87% chance that Obama will be the Democratic candidate for President in 2012, and a 60% chance that the Democratic candidate will win the 2012 election. Manufacturing activity in the central Atlantic region expanded for the fourth straight month, according to the Richmond Fed’s latest survey. 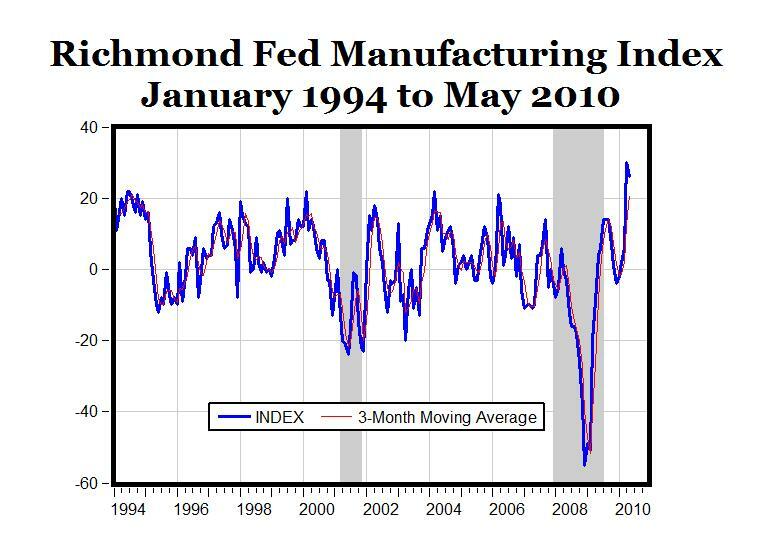 MP: The Richmond Fed index has now been positive in 10 out of the last 12 months, the first time since 2004 of that many positive readings in a one-year period since 2004. 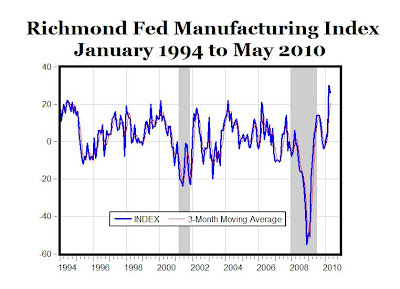 Also, the two latest monthly readings of 30 in April and 26 in May are the two highest Richmond Fed index values in the history of the index back to 1994. Markets in Everything: Online Medicine "Zipnosis"
"Nancy Kjellberg's allergies were insufferable again, with sharp sinus pain and her nose so stuffed up it was hard to breathe. She didn't want to go to the doctor. This time, she didn't have to. Kjellberg, 59, simply charged $25 to her credit card and spent a few minutes answering an online survey at Zipnosis.com. Hours later, she received a diagnosis electronically and picked up antibiotics at her pharmacy, without ever talking to the clinician in person or on the phone. Minneapolis-based Zipnosis thinks it is onto the latest innovation in convenient health care for minor ailments like common colds, allergies or bladder infections. Led by Rick Krieger, who co-founded a company that became MinuteClinic, Zipnosis started a one-year pilot this month with local provider Park Nicollet Health Services. Already, more than 300 people statewide have used the service. Consumers fill out Zipnosis' survey online, and two nurse practitioners on duty at Park Nicollet's Quick Check center review the answers and send back a diagnosis." 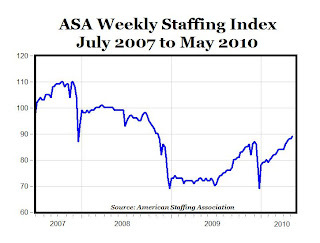 The American Staffing Association (ASA) reported that its weekly index reached a 78-week high of 89 during the week of May 10, the highest reading since early November 2008, 18 months ago (see top chart above). 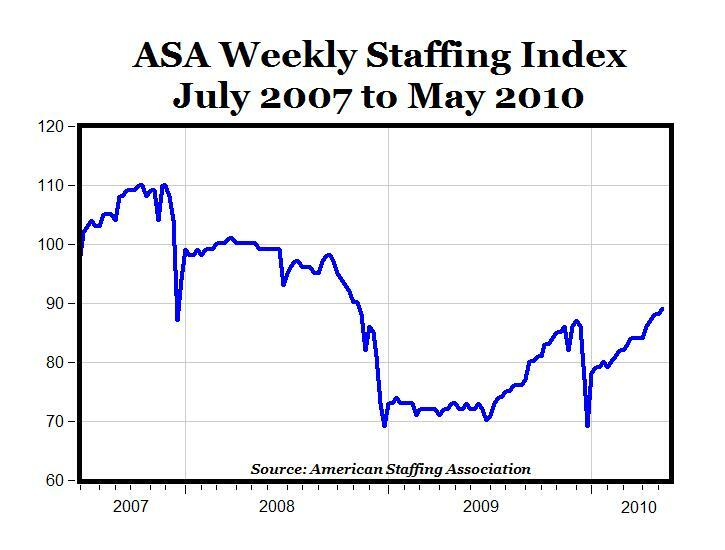 In the first 19 weeks of this year, the Staffing Index has increased or remained flat in every week except one. Compared to the same week in the previous year, the ASA index increased by 23.6% in the second week of May, and has registered double-digit percentage increases for the last 13 weeks (see bottom chart above). Note: Temporary hiring is often the first step towards a permanent, full-time position, and it's becoming increasingly common for companies to hire new workers on a 90-day temporary basis, and then those temporary positions often get converted to full-time positions after the trial period. 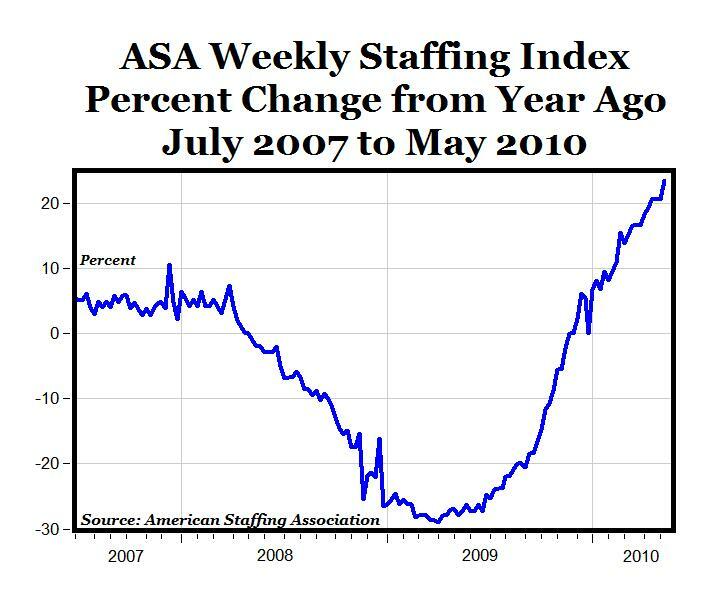 For example: "Temporary employment is filling a key niche during the current spike in joblessness. But, perhaps its most important function is that it doesn't necessarily have to be temporary. More employers are starting to turn interim positions into full-time job opportunities." "In one [vision], America will continue to be an exceptional nation organized around the principles of free enterprise—limited government, a reliance on entrepreneurship and rewards determined by market forces. In the other, America will move toward European-style statism grounded in expanding bureaucracies, a managed economy and large-scale income redistribution. These visions are not reconcilable. We must choose." "Rather than making history for its deep recession and record unemployment, 2009 might instead be remembered as the year business startups reached their highest level in 14 years—even exceeding the number of startups during the peak 1999-2000 technology boom (see chart above). 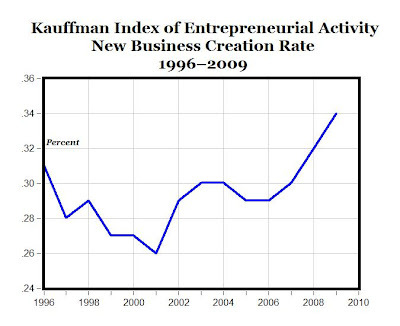 In 2009, the 340 out of 100,000 adults who started businesses each month represent a 4 percent increase over 2008, or 27,000 more starts per month than in 2008 and 60,000 more starts per month than in 2007." Read more here at the Enterprise Blog. 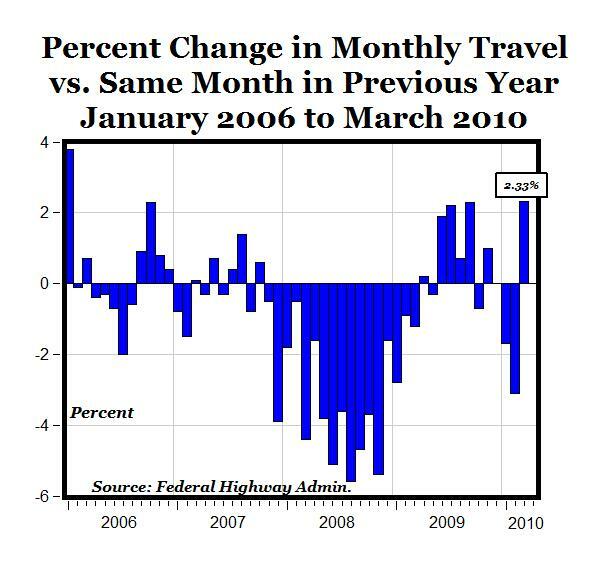 According to data released today by the Department of Transportation, travel on all U.S. roads and streets increased by +2.33% (5.8 billion vehicle miles) in March 2010 compared to March last year. That increase is the largest monthly gain since a 3.8% increase in January 2006, more than four years ago. And the March increase in travel happened during a month with gas prices rising to 18-month highs, and with prices at the pump about $1 per gallon higher than March 2009, so it will be interesting to see if the increased traffic volume continues through the summer now that gas prices are falling and the economy is expanding. As I reported recently, truck tonnage jumped 7.5% in March, which was the largest year-to-year monthly increase since January 2005. America's moving again. 1. "Preventive confiscation" of 120 tons of food in Venezuela to allegedly "avoid the phenomenon of empty shelves at grocery stores," which are actually caused by the price controls Chavez imposed in 2003. 2. Rent Control Is a Vanishing New York Treasure -- "Outside of prime neighborhoods, the restricted rents are not such a great bargain, in many cases barely cheaper than what the apartments could fetch on the open market. These deteriorating low-priced apartments still exist partly because landlords have little financial incentive to make renovations or apply for rent increases." Maybe rent control isn't really such a "treasure" after all. And maybe, just maybe, and I could be wrong here, but maybe the food shortages and empty shelves in Venezuela, and the shortage of affordable apartments in NYC are actually caused by price controls? Last week I featured the latest CEO survey results on the Best and Worst States for Business 2010, and North Carolina ranked #2 for the best state business climate (behind #1 Texas) with B+ grades for both "taxation and regulation" and "workforce quality" and a grade of A- for "living environment." "American Express is planning to bring a $400 million data services center to North Carolina, and it will do so without the types of incentives many companies look to pry from state and local governments. American Express already has a Greensboro call center that employs 2,000 workers. Local officials had considered offering up to $13 million in incentives to entice another facility." "A common perception among lawmakers is that companies don’t care about good tax policy. If forced to choose between broad-based, low-rate, neutral taxes, or special targeted tax incentives that benefit only their company, conventional wisdom is that companies prefer targeted tax carve-outs every time. But this is often not true. Many large companies are well aware of the dual-edged nature of special targeted tax incentives. Tax preferences designed to boost corporate investment may provide short-term advantages to some companies—and allow lawmakers to take credit for new jobs in campaign speeches—but in the long run they add enormous complexity to the code, and ultimately transform the tax system into an economic minefield of narrow bases and punitively high rates." MP: In this case, it looks like the overall low-tax, business-friendly climate of North Carolina was more important to American Express in the long run for its facility expansion decision, than the short-run tax benefits it was offered. Maybe more states should follow top-ranked states like Texas and North Carolina and create a permanent, ongoing favorable business climate with low taxes, small government and right-to-work laws, rather that try to offset their generally anti-business environments with some publicity-generating targeted tax incentives (like 49th ranked Michigan and its generous 40% refundable tax credits for making films in the state). "Led by continued improvements in production- and employment-related indicators, the Chicago Fed National Activity Index increased to +0.29 in April, up from +0.13 in March. April marked the highest level of the index since December 2006 and the third time in the past four months that the index indicated above-average economic activity. Three of the four broad categories of indicators that make up the index made positive contributions in April, while the consumption and housing category made the lone negative contribution. 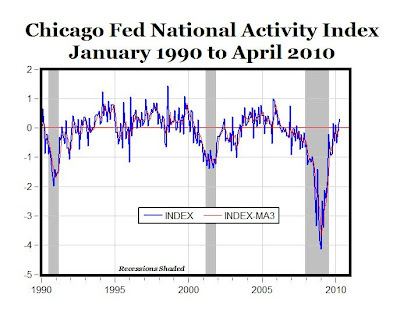 The index’s three-month moving average, CFNAI-MA3, increased to –0.03 in April from –0.09 in March, reaching its highest level since February 2007. April’s CFNAI-MA3 suggests that growth in national economic activity was very near its historical trend. With the index still slightly below trend, there remains some economic slack, suggesting subdued inflationary pressure from economic activity over the coming year." MP: More evidence here of the ongoing V-shaped economic recovery. - below 10 will have their green fees increased by 35%. - between 11 and 18 will see no increase in green fees. - above 18 will get a $25 check each time they play. -for handicaps below 10, an additional $10. -between 11 and 18, no additional amount. -above 18, you will receive the total amount in the pot even if you do not play. -handicaps below 10, no entitlements. -handicaps from 11 to 17, entitlements for putter length putts. -handicaps above 18, if your ball is on green, no need to putt, just pick it up. See related CD post here on bowling. NY Times -- "Roughly 3,700 retired public workers in New York are getting pensions of more than $100,000 a year. The New York Times collected this public information from the state’s two pension funds and four of the five city funds. The pension plan for the city's firefighters has yet to provide information, as required under public information laws. Some pension funds said they could not provide figures like job title or final salary; the N.Y.P.D. Pension Fund wouldn't not disclose names." See list here and related article here. MP: There are more than 22 retirees receiving more than $200,000 per year, and one receiving more than $300,000. In total, New York taxpayers are paying more than $370 million per year to just this partial group of retired New York public workers, which doesn't include those receiving less than $100,000 per year and doesn't include New York firefighters. If this group of retired workers on the NY Times list was considered as a separate national economy, it would rank as the 178th largest country in the world by GDP. Also, note that most of the listed annual pension amounts are roughly 80% of the workers' final year salaries. Update: New York ranks #4 on this list of states most likely to default. From The Atlantic: "Having examined the finances of all 43 presidents, we calculated the net worth figures for each in 2010 dollars. Because a number of presidents, particularly in the early 19th Century, made and lost huge fortunes in a matter of a few years, the number for each man is based on his net worth at its peak. We have taken into account hard assets like land, estimated lifetime savings based on work history, inheritance, homes, and money paid for services, which include things as diverse as their salary as Collector of Customs at the Port of New York to membership on Fortune 500 boards. Royalties on books have also been taken into account, along with ownership of companies and yields from family estates. The net worth of the presidents varies widely. George Washington was worth more than half a billion in today's dollars. Several presidents went bankrupt." MP: What's interesting is that George Washington was probably the wealthiest U.S. president with $525 million of net worth, depending on how you count the entire Kennedy family estate of $1 billion towards JFK's net worth. Also, it's pretty amazing that Bill Clinton's net worth of $38 million is almost as much as the combined net worth of both Bush Presidents together ($43 million total), see chart above. There's a critical shortage of scientists and engineers in the United States, right? We hear that all the time, and that's what I thought. Until I checked the data. 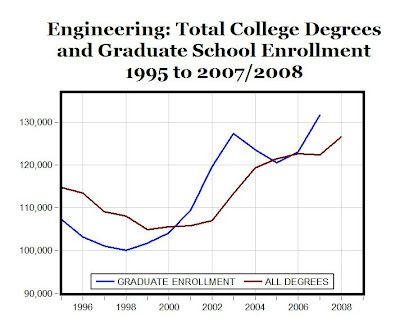 According to Department of Education data, there was a record high number of engineering degrees granted in 2008 (most recent year available, see chart above), a total of 126,612 (83,853 bachelor's degrees, 34,592 master's, and 8,167 doctor's), which is an increase of more than 18 percent from 2002. Bachelor's degrees in engineering are down from the peak years of 1984-1987, when more than 90,000 students were graduating with undergraduate engineering degrees, but graduate degrees have increased dramatically - Master's degrees in engineering have doubled since 1981 and doctor's degrees have doubled since 1987. 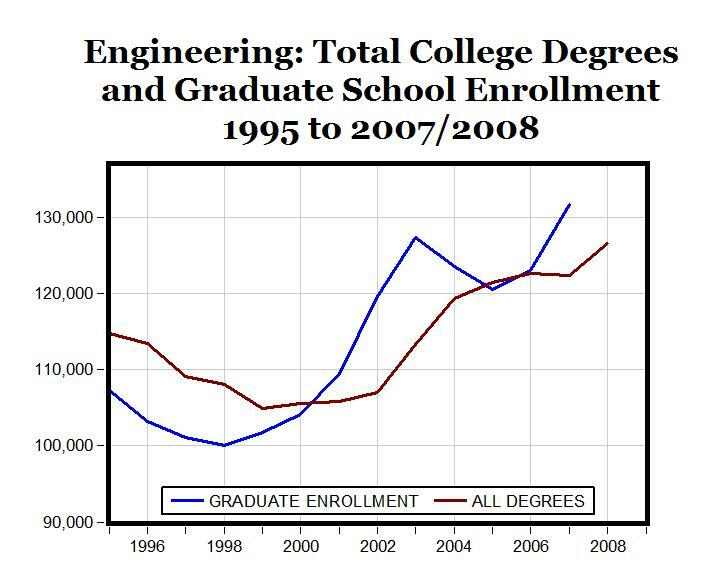 Data for enrollment in graduate engineering programs show a similar upward trend, with a record high 131,676 graduate engineering students in 2007 (most recent year available, see chart). With record high graduate enrollment, there should be a continuation of the ongoing increases in engineering graduate degrees. If you do a Google search for "shortage of engineers," the top links are for articles with titles like "There is NO Engineering Shortage," "What Shortage of Scientists and Engineers? ", "Study: There is No Shortage of U.S. Engineers," and "Scientist Shortage? Maybe Not." So I guess I'm coming late to the discussion here, but this is my contribution to the myth-busting about the mythical "engineering shortage." Forrest’s practice, Access Healthcare, was born out of his frustration with the bureaucratic system run by major health care providers and insurance companies. His epiphany came about 10 years ago, as he was completing his family medicine residency at Wake Forest University. “I was basically being told I needed to see 30 patients a day every day, and that’s what we had to do,” he recalls, speaking with a soft drawl. He didn’t care for that pace, preferring to spend 45 minutes to an hour with each patient. He spent some time researching alternative business models and found inspiration in People magazine, of all places, which profiled a Vermont doctor who carried a stopwatch, charged patients $2 a minute, and didn’t take insurance. Forrest decided to take a similar approach—minus the stopwatch. Clients pay him cash when they’re seen, known in the industry as “fee-for-service.” He sees a maximum of 16 patients a day and leaves the office at 5 p.m. Because he doesn’t have to file insurance forms, he only needs a single office assistant, and the low overhead allows him to charge less than other doctors. Occasionally, his charges wind up being less than just the co-pays for Medicare or private insurance." According to the Institute for Justice (a national public interest law firm that has filed a federal lawsuit in U.S. District Court challenging Lake Elmo’s trade ban as a violation of fundamental constitutional rights): "Lake Elmo, Minn., forbids farmers from selling agricultural products from their own land unless the products are grown within the city limits. If a Lake Elmo farmer grows some of his crops in another town or another state, he cannot sell them from his Lake Elmo farm. Products grown in town are allowed; products from elsewhere are not." Why stop there? Why not apply this same trade ban to grocery stores, gas stations, restaurants, car dealers, clothing stores, and movie theaters in Lake Elmo? That is, if self-sufficiency for agricultural products is good for Lake Elmo, wouldn't self-sufficiency for all products be even better? And if self-sufficiency for the entire community is good, wouldn't self-sufficiency for neighborhoods within Lake Elmo be even better? Why should residents of the west side of Lake Elmo patronize businesses, restaurants and farms on the east side of Lake Elmo by buying their agricultural products, food and other items - doesn't that take away jobs from the west side and export them to the east side of the city? But then why not self-sufficiency at the household level, wouldn't that be even better? Why should you export your family's jobs to your neighbors across the street by buying their tomatoes? Why buy any "out-of-household" goods or services - doesn't that just take away jobs from your own household? This kind of protectionist self-sufficiency at the city level simply doesn't make any economic sense - it will impoverish the Lake Elmo residents, not make them better off, just like self-sufficiency doesn't make sense at the national level, household level, or any level. 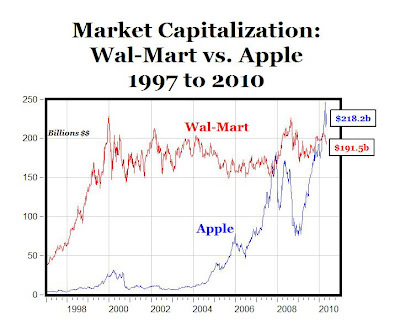 Apple's (AAPL) market capitalization (~$218.2 billion today) has been higher than Wal-Mart's (~$191.5 billion) for about the last three months (see chart above), which is especially interesting considering that Apple's market cap was less than $10 billion in late 2003 when Wal-Mart's value was almost $200 billion. 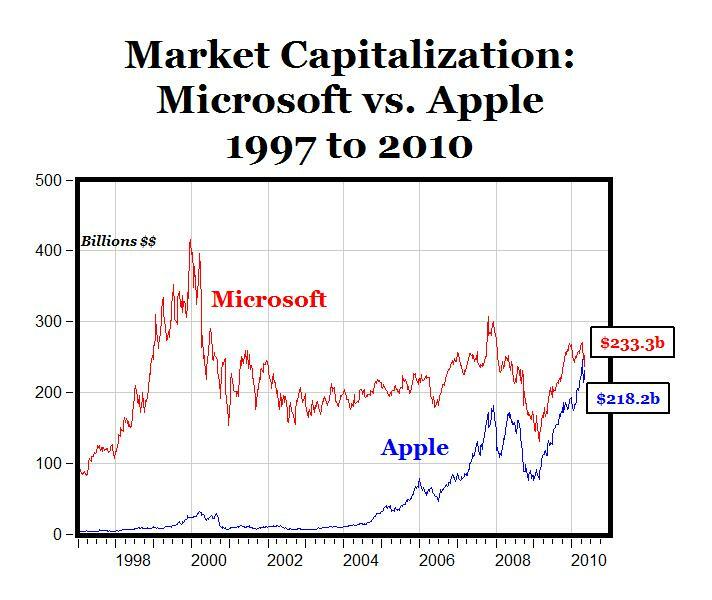 Apple hasn't quite caught up yet to Microsoft's market capitalization, but it's getting pretty close - they're only about $15 billion apart now; $233.3 billion for Microsoft vs. $218.2 billion for Apple (see chart below). May 21 (Bloomberg) -- "Wal-Mart Stores Inc., the world’s largest retailer, is seeking to take over U.S. transportation services from suppliers in an effort to reduce the cost of hauling goods. The company is contacting all manufacturers that provide products to its more than 4,000 U.S. stores and Sam’s Club membership warehouse clubs, said Kelly Abney, Wal-Mart’s vice president of corporate transportation in charge of the project. The goal is to take over deliveries in instances where Wal-Mart can do the same job for less and use those savings to reduce prices in stores, he said. Under the program, Wal-Mart is increasing the use of contractors, as well as its own private fleet of trucks, to pick up products directly from manufacturers and transport the goods to its distribution centers and stores. The retailer currently moves most goods only from its distribution centers to stores. The plan allows Wal-Mart’s fleet of 6,500 trucks and 55,000 trailers to carry more per truck and improve on-time delivery rates, said Leon Nicholas, a director at consulting firm Kantar Retail. Wal-Mart would also have more sway in negotiating fuel prices." MP: Another example of why Wal-Mart is the world's leading retailer and how its relentless pursuit of supply chain efficiencies and other cost-cutting measures allows Wal-Mart to keep lowering prices to consumers, and in the process make millions of Americans better off. 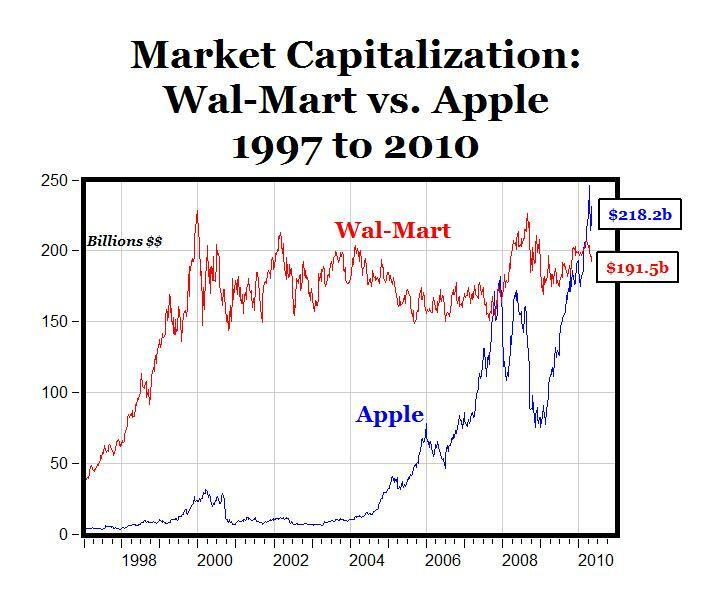 In Wal-Mart's world, the consumers reign as the kings and queens, and there's probably no better example of consumer sovereignty than Wal-Mart. 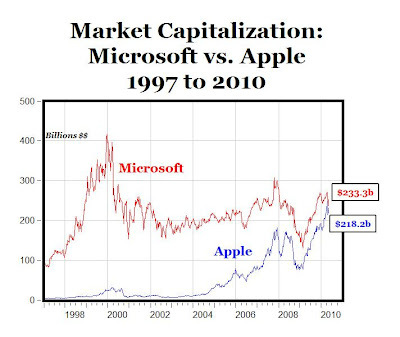 Thanks to Norman Berger for the Wal-Mart link.